Blue Petel Diamond is Manufacturer & Exporter of Antique Necklace Set. Our product range also comprises of CZ Necklace Sets, CZ Finger Rings and CZ Earrings. Came into existence in the year 2009, we, Blue Petel Diamond, are one of the leading manufacturers, suppliers, distributors, wholesalers and traders of best quality Imitation Jewelry, Artificial & Fashion Jewelry, Costume Jewelery, American Diamond Jewelery, Antique Jewelery, Kundan Jewelery, Indian Traditional jewelery, Indian CZ jewelery, Kolkata Jewelery, Indian Ethnic Jewelery, Indian Wedding Jewelery and Online imitation Jewelery. The product range offered by us is inclusive of CZ Necklace Sets, CZ Finger Rings, CZ Earrings. 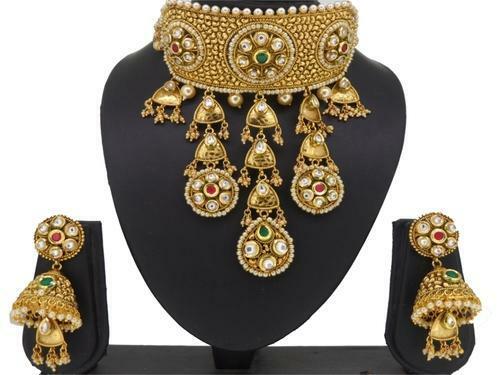 For designing the offered range of imitation jewelry items, our designers make use of advance cutting, polishing and designing tools. Offered jewelry items are designed in accord with the prevailing market trends by using best quality imitation stones, gems and jewels. Quality of the offered range is our utmost priority and it is maintained at our end as per the industry set norms. Due to their contemporary design, impeccable finish, eye-catching appearance, excellent sheen, lightweight and alluring pattern, these imitation jewelry items are highly demanded in the market. In addition to this, the offered imitation jewelry items are available with us in all the standard sizes, designs and patterns.